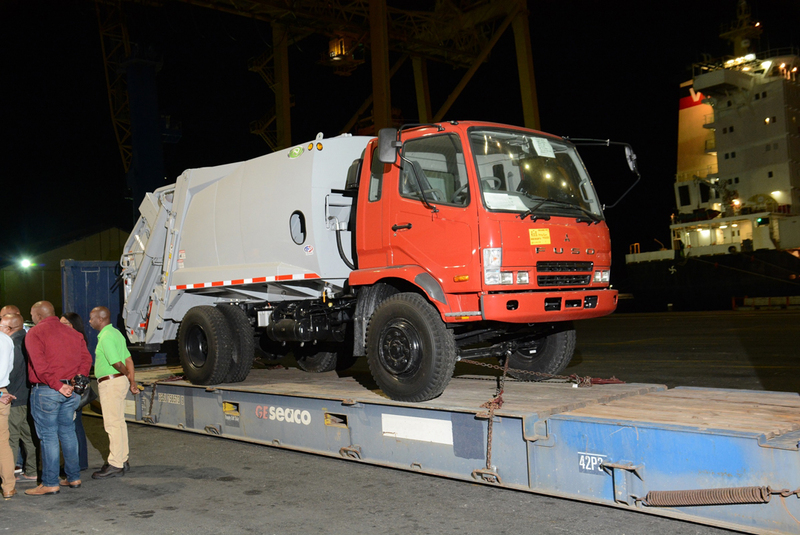 The trucks arrived on Wednesday morning and a team from SSA Board and management met with members of the media at the Bridgetown Port around midnight, to witness the $600 000 reconditioned refuse compactor vehicles being lifted from the cargo vessel after port officials expertly shifted several containers to extract the Mitsubishi Fuso trucks. Minister Environment and National Beautification, Trevor Prescod, was on hand and said this was just an example of government living up to its promises and accomplishing in just seven months, what the former administration was not able to accomplish in ten years. He revealed that going into 2019 there were are on average 12 trucks working to keep Barbados clean on a daily basis, but he assured that this number will be increased. “We have some trucks and there are some small defects but there are no parts, but as soon as we get the parts, we add to the amount of vehicles available. Because they are working extremely hard. They are over 12 years [old]. We have to be constantly still servicing them. There is still a sense of maintenance that has to be applied, if not we will end up with six,” he explained. He said there are four private haulers working with the SSA and with the additional trucks that have been ordered, the fleet could be increased to the 20s in coming months. He noted that the goal is to standardise the fleet, as it relates to parts and maintenance. Minister Prescod stated that the trucks, which are noticeably smaller, have a load capacity of five tonnes, and are more suited to the smaller communities where roads are narrow. The additional five trucks on the way will be larger and will have a capacity of 12 tonnes. He said Simpson Motors, which has been the agency responsible for the importation of the vehicles, indicated that there had been a number of challenges in getting the vehicles to Barbados. “It is the first time it has happened to them. Between the exporters – the manufacturers in Japan and the trans-shipment to the United States of America. There were some problems related to tariff arrangements between Japan and the USA. And these caused a lot of challenges. In some cases a delay, because the trucks had to go to the US in order to be retrofitted and there were some difficulties with steel and so on… that caused a delay in the delivery. Minister Prescod thanked the members of the SSA for their tireless work even though, as he said, persons have been spreading propaganda and misrepresenting the reality in Barbados. He also revealed that public service campaign has begun and is intended to educate the public about the benefits of the contentious Garbage and Sewage Contribution levy. Minister Prescod also told the media that the SSA will be providing a number of additional refuse bins across the country. By Janelle Husbands for The Barbados Advocate.